This adjustable keyboard management system offers the ideal solution for stations with little or no space under the work surface. Works great in laboratories and settings with mobile workstations. 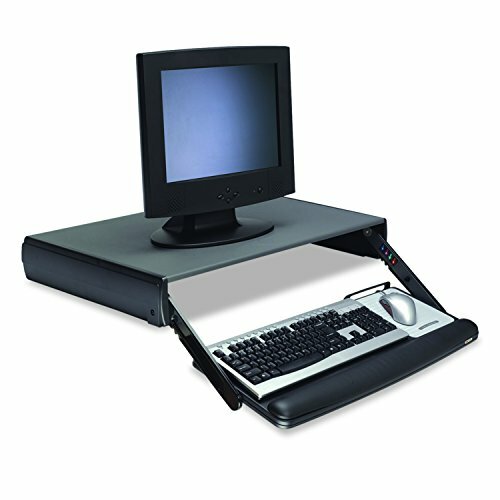 Desktop design provides 4 height adjustments up to 3.75" below desk level with unlimited tilt. Wide platform includes ample space to place mousing surface next to keyboard for comfort. Leatherette gel wrist rest with antimicrobial product protection is easy to clean. Stable and easy to use with steel reinforced construction. No installation required. Accepts keyboards with maximum height of 1.5" . 5 year warranty. 3MTM Adjustabe Desktop Keyboard Drawer KD95CG, 27.87in x 16.82 in x 4.0 in, Charcoal GreyBlack. 3MTM Keyboard Drawers can help maximize workplace comfort and productivity with the support you need and comfort you want. The desktop design is height and tilt adjustable up to 3 1/4" below desk level and wide platform keeps mouse and keyboard at same level for added comfort. Includes incredibly soft gel-filled wrist rest and full size mousing area. No installation required. Lifetime warranty. Also try 3M Adjustable Keyboard Trays. 3M(TM) Adjustabe Desktop Keyboard Drawer KD95CG, 27.87in x 16.82 in x 4.0 in, Charcoal GreyBlack. 3M Keyboard Drawers can help maximize workplace comfort and productivity with the support you need and comfort you want.